They’re freshmen. They’re engineering majors. And they’re roommates in Wright State University’s Honors Community. So you would think there would be a lot of banter about algorithms and hydraulics. And there probably is. But there is also talk about harmony, melody and pitch. 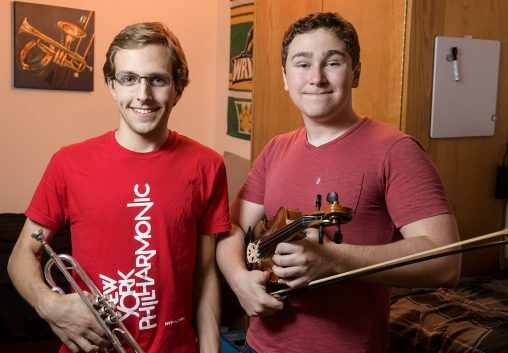 Engineering students Ryan Slater and Alex Vehre are accomplished musicians who play in pit orchestras, a select and demanding world. Slater grew up in Bellbrook. He started playing the trumpet in middle school, inspired by the trumpet playing of his father, Joseph Slater, who is chair of the Department of Mechanical and Materials Engineering in the Wright State College of Engineering and Computer Science. “Something clicked, and I really fell in love with it,” said the younger Slater. He played the trumpet in high school musicals and was first selected to play in a professional pit orchestra when he was a junior in high school, for “Young Frankenstein.” He has been in pit orchestras for five different musicals, most recently for “The Hunchback of Notre Dame” at the Victoria Theatre for three shows in September. Pit orchestras accompany performers in musicals, operas, ballets and other shows involving music, which must be coordinated with the performers. Judy Mansky, director of the pit orchestra for “Hunchback,” said musicians in pit orchestras must not only be good but also aware and flexible. Pit orchestra musicians sit in a lowered area in front of the stage, out of the view of the audience. “The idea is we’re invisible,” said Slater. Mansky applauds Victoria Theatre for using live music in its productions. “It’s not done everywhere, and people tend to take it for granted when it is there,” she said. Ryan Slater and Alex Vehre performed together as members of the Dayton Philharmonic Youth Orchestra. Vehre, a mechanical engineering major, grew up in Greenville. His mother is a physician who works at a Greenville clinic, and his father is director of the Greenville Public Library. Vehre started playing the violin in second grade. 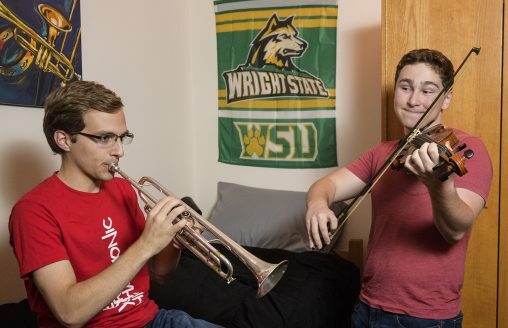 Both Slater and Vehre were in the Dayton Philharmonic Youth Orchestra at the same time but didn’t really get to know each other until they were assigned as roommates at Wright State this year. Vehre has twice played in pit orchestra productions, once with Slater. Mansky, who has a degree in flute performance from the Dana School of Music and is an active freelance musician, says she enjoys having non-music majors in the orchestra because of the diversity they bring. Engineering felt like a natural fit to Vehre careerwise. Slater, a computer engineering major, become interested in engineering in middle school. He participated in science fairs and was part of FIRST LEGO League, an international competition that includes designing and programming robots. During the summers, he interned at Wright-Patterson Air Force Base through the Wright Scholar Research Assistant Program and worked in the Materials and Sensors directorates. He is currently embarking on an internship at the Air Force Institute of Technology. During his internships, Slater taught himself how to write Python, a high-level computer programming language designed to be flexible and emphasize readability. Slater and Vehre’s passion for engineering is even evident in their dorm room. Tracing the edge of the ceiling is a string of LED lights programmed to change color with the weather. Sunny skies keeps them yellow; high temps turn them red; low temps turn them blue. And rain makes them flash.